Your phone must be rooted to use this app!! Again, ROOT PERMISSION IS REQUIRED TO RUN THIS APP! 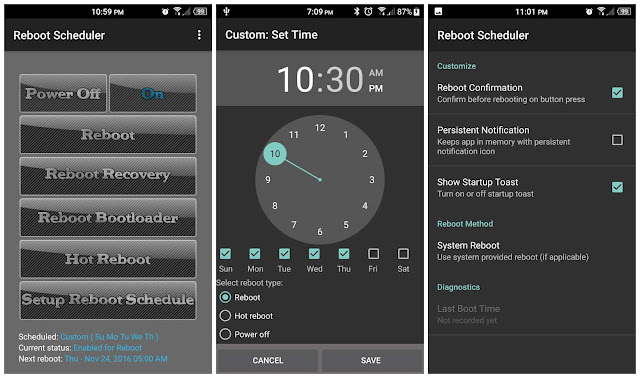 Reboot Scheduler application to schedule reboots for your phone on a daily basis. Schedule options include; reboot, hot reboot and power down with options to clear all app cache and dalvik-cache. If using hot reboot for scheduling, you must first hit the button and accept the superuser permission. App contains buttons to power your phone off, reboot, hot reboot, reboot to bootloader and reboot to recovery. App currently contains an enable/disable widget with more widgets coming soon. Also am going to be adding more scheduling options in the near future. App layout looks best on XHDPI phone displays. Power the phone off (shut down). Hot reboot (reboot system, much faster than reg reboot). Schedule time for reboot, hot reboot or shutdown. Schedule clearing cache and dalvik-cache. Monday through Friday Schedule Option. Custom option (select the days you want). Turn on or off reboot confirmations with button press. Turn on or off startup toast notifications. Storage – modify/delete SD card contents: this is to backup your schedule to SDcard. Phone calls – read phone state and identity: used to see if user is on a phone call. 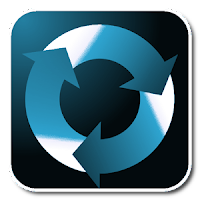 System tools – automatically start at boot: this is for the app to schedule the next reboot.